Joyce Perz of Sashiko Southwest is an artist with a vision. 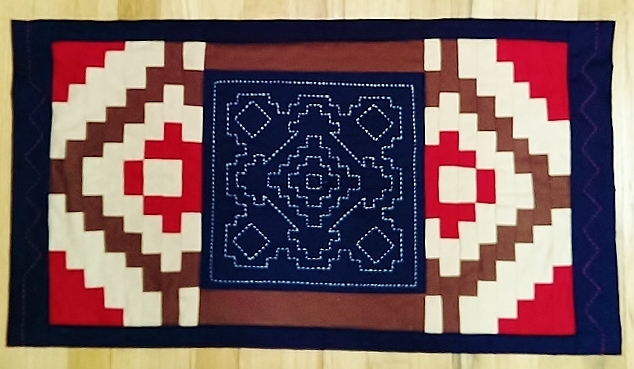 She enjoys the classic style of Japanese sashiko, but living in Albuquerque, New Mexico, she is exposed to Southwest Native American tribal art in all its beautiful geometry. In combining the two she has created a collection of beautiful hybrid designs. I had the pleasure of meeting Joyce while I was working at AQS Quilt Week Albuquerque in January of this year. Her personality and energy were inspiring, and I was excited to see her kits fly off the display in my booth during show. Printed on Kona cotton with a wash-out ink, these kits are similar to the widely available Olympus kits many of us are already familiar with, but with a playful flair and unique take on both Native American art and traditional Japanese design. While these look great with white thread on dark blue cotton, you could spice one up with a change of thread color, or use it as a centerpiece in a larger project. These little kits make inexpensive, easy weekend projects, or bring one along to do while you’re waiting for an appointment (that’s how I get a lot of my sashiko done!). No hoop needed, just fabric, needle, thread, and maybe a sashiko thimble. I have several designs available in the Kimonomomo Etsy shop right now and available at quilt shows (check the schedule to the right), or you can order directly from Joyce at SashikoSouthwest.com. Next Post Thimbles thimbles thimbles! And more thimbles. I can’t wait to see the new designs. Are you still planning on coming to Grand Rapids for AQS? Hi Judy, yes!! I’ll be there. Will you have time to work the booth with me this year? Family comes first, but it would be great if you can make it. Love the sashiko/southwest patterns together. Wonderful melding of cultures and aesthetics.